Opportunities, usually later in life and during retirement, can allow us to engage in a ‘portfolio’ of activities proving to be both constructive and pleasurable, including co-operating with other residents with different perspectives and motivations of their own. I have presumed to describe my own experiences of volunteering and public office in Rowlands Castle and elsewhere to provide examples. I strongly encourage others to follow suit! Being elected to Hampshire County Council, I found most stimulating, as was my other public appointment to the Environment Agency. Although offering limited allowances, but usually paying some costs, volunteering can provide personal satisfaction, and enable one to ‘make a difference’. 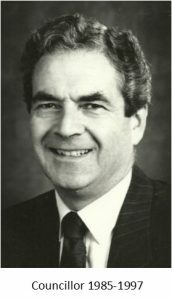 In 1985 I was elected to Hampshire County Council ‘Catherington Division’ as a Liberal Democrat. At the time, the Division included the three local parishes of Horndean, Clanfield and Rowlands Castle. I struggled to be re-elected in 1989, but I achieved another sound majority in 1993, serving for three terms, a total of twelve years. During my last four years of public office, the Liberal Democrats were returned as the largest party and agreed to run the administration of the Council jointly with the Labour Party. This provided opportunities to set the agenda, by chairing committees and panels. On election, Council members benefitted from briefings and tours of the County – much information to absorb, being a large, historic County, with a population of over a million residents. The formal briefings covered both the Council’s legal and discretionary roles and responsibilities. A more detailed description of my goals and steps to achieve them is offered in the Appendix, below. Throughout the twelve years, I served on the Planning & Transportation Committee. I was on the Education Committee for two years, the Police Authority for one term, and the key Policy and Resources Committee for most of my last term. Overall, serving on the County Council provided possibly the most fulfilling experience of my life. I enjoyed my time, sitting on many committees and panels, and gaining satisfaction from working informally with the officers. In 1997, however, I decided to stand down. 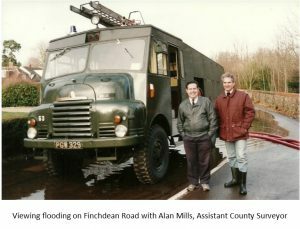 Shortly after standing down from the County Council, I applied and was appointed by the former MAFF (now Department for the Environment) to the Southern Region Flood Defence Committee of the Environment Agency. I served for eight years. I was also asked to chair the Hampshire & Isle of Wight Local Flood Defence Committee. The Agency’s regional office was in Worthing. The experience was most interesting, focussing on ‘water’ as a critical issue in the South East; protecting groundwater supplies, watercourses, rivers and reservoirs; and flood management of both rivers and coasts. Environmental improvements were also addressed as a high priority. At the same time, I continued with other voluntary activities on the Council of the Solent Protection Society, and as a trustee of CPRE Hampshire (Campaign for the Protection of Rural England), both having an environmental focus. In 1999, possibly due to my general experiences on the County Council, I was honoured to be invited to become the first President of the Rowlands Castle Association – a non-executive role. I was subsequently re-appointed annually. ‘Retirement’ finally arrived after my Environment Agency duties. I volunteered to be a member of the project teams that drafted the Parish Plan published in 2008, and later the Local Landscape Character Assessment published in 2012. Both were initiated by the Parish Council as ‘arms-length activities’, drafted by independent groups although including representatives of both the Parish Council and Rowlands Castle Association. In 2015, Rowlands Castle Heritage Centre became my most engrossing activity. 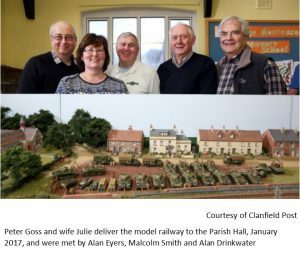 Initially this focussed on the purchase of the iconic model railway built by Peter Goss, showing the Village preparing for the Normandy Landings on D-Day, in June of 1946. Peter Goss had offered the model for sale to the village. In addition to buying the model railway, a group of volunteers decided to create a Heritage Centre which involved launching this website as a virtual museum, registering as a charity, and searching for a building to serve as a museum, or even as a ‘community hub’. A lease on the railway station is still being considered. If you are interested in becoming a volunteer, the following is a list of organisations in Rowlands Castle which provide opportunities for the whole local population, rather than a specific group or a more limited range of activities. Residents interested in volunteering are encouraged to discuss opportunities with the chairperson, clerk or secretary, or any member. The appendix is intended to provide more detail on the main activities I engaged in during my twelve years as the local elected representative on Hampshire County Council, when I believe that I did ‘make a difference’! The main aspects of being a representative were keeping in touch with the local community – both individual residents and organisations – as well as to take part in wider County Council business through committee work and in discussion with fellow members and officers. To focus my attention and effort, I set my own priorities as described below. They embrace planning matters including housing numbers and related issues of traffic and highways. Highways & Footways My initial focus in Rowlands Castle was on improving footways to safeguard pedestrians. The first was along the last few yards of Links Lane to The Green and past the United Reformed Church, where pedestrians once walked in the road, to the Parish Hall and Recreation Ground. Later, I asked whether footways were achievable through the Railway Arches by The Castle Inn and later still, under the arch at Dean Lane End. Thirdly, both Castle Road and Finchdean Road had long footways only just above road level, so I sought to make them safer by having them rekerbed and rebuilt along their entire lengths. I also sought to improve traffic flow from Redhill Road into Manor Lodge and Durrants Roads, for which the twin, mini roundabouts were proposed, and then implemented. (Now under review again, as traffic continues to increase). Car parking, particularly around The Green, was also an issue in the 1980s, and white and yellow lines were progressively introduced. A major scheme was undertaken during my last term of office, to improve Durrants Bends (B2149) by improving sight lines, mitigating an adverse camber on the main bend, and introducing a cycle way. This was followed by a scheme to improve Manor Lodge Road north through Havant Thicket to address humps and bumps caused by seasonal movement in the clay base. Stabilisation was achieved by laying ‘geo-membrane’ over foundations before relaying the road surface. Horndean Community School, now known as Horndean Technology College, was my major focus at ‘Division’ level. It was the largest ‘establishment’ in the Division, eventually growing to over 1,500 pupils. So, any improvements would benefit a large section of the community. The School had already outgrown its original buildings and could not offer ‘whole school assemblies’, for example. Further buildings were necessary. I was also interested in the better use of school buildings during evenings, weekends and holidays for the benefit of the wider community. At that time, The County Council was approving designation of ‘community schools’ whereby a school would receive additional funding for community officers to arrange out-of-hours sports and social activities. As a councillor, I was required to appoint five governors to the governing body of the School, and I could also appoint myself. I briefed governor candidates on the proposal for ‘community school’ status. Similarly, when appointing a new headteacher, I was able to brief other councillors and officers in the selection process, so that a new headteacher with community school experience could be appointed. The new head teacher conducted the required researches, obtained the necessary approvals for community school status. Community officers were duly appointed . This opened the way for construction of a new multi-purpose hall with social facilities to meet both school and community needs. I asked to sit on the Education Committee to seek funding for the hall. Later, I enjoyed several music concerts in this hall. I eventually served as a governor of the School for sixteen years, covering appointments of three headteachers, and witnessed growth of pupil numbers to nearly two thousand. At that time, the School had a Sixth Form for which a dedicated classroom block was built. By way of addendum, there were eight schools in the electoral division including the Community School: two Middle Schools, four First Schools and one Primary School. At that time, I was also responsible for appointing LEA governors to each school, the number depending on the size of the school. I maintained contact with head teachers, particularly when several new building projects were involved – the County Council was also the ‘landlord’ as well as the ‘Education Authority’. 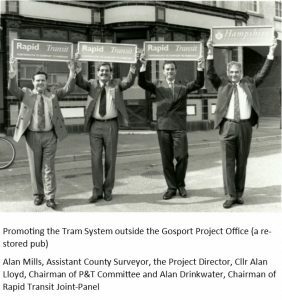 South Hampshire Rapid Transit – was a Super Tram project from Fareham to Gosport, then under the harbour in a ‘cut and cover’ tunnel to Portsmouth. During my third term of office, the Liberal Democrats formed the Council’s administration: as the only Liberal Democrat who had served on the previous Super Tram Panel, I was asked to chair the new Panel. I was willing to do this provided it was agreed to implement the tram project which had demonstrated the best ‘cost/benefit ratio’. The project from Fareham to Portsmouth Centre had the best case as it ran along a well populated but traffic congested corridor. £500,000 would be needed each year to fund the development team and relevant studies, so the County budget was adjusted accordingly. I was to chair a newly created Joint-Members Super Tram Panel with councillors from the other three councils involved – Portsmouth, Fareham and Gosport – aiming to ensure support for the scheme across all four. By 1997 at the time I stood down from the Council, proposals for the scheme had been prepared and agreed, and the Department for Transport had given its approval, with some Government funding being available. However, later in 1997 both Portsmouth and Southampton became independent ‘unitary authorities’, no longer part of the County Council. This required that the Rapid Transit scheme should be resubmitted as a joint project between the County and newly independent Portsmouth City Council. During the following four years, the scheme was again approved, and the two Councils invited consortia to ‘plan, construct, operate, maintain and fund’ the scheme. One consortium was being selected to finalise arrangements when the Government announced that two new large aircraft carriers would be built, to be based in Portsmouth Harbour. For the tram system, this would require a deeper tunnel, and revision of ramps and portals for the trams. Councils could not agree the additional costs which lead to the scheme’s demise. Apart from existence of detailed plans, one positive outcome was the introduction of a fast bus service with exclusive access along the former railway embankment from Gosport towards Fareham, alleviating some traffic congestion. I still regret that such a modern transport system was not successfully implemented. 4a. SERPLAN: During my third term of office, I volunteered to be the third Councillor representative to SERPLAN – the London and South East Regional Planning Conference – which met three times a year in London to consider planning matters and draft the regional planning guidance (RPG5) for submission to the Government. SERPLAN was a voluntary association of representatives from County, Unitary and District Councils in the greater South East – from Essex to Berkshire and across to Kent, with the London Boroughs represented by LPAC – the London Planning Advisory Committee. SERPLAN was serviced by a small group of planning officers based in an office in London, ‘supervised’ by nominated County Chief Executives and Planning Officers. SERPLAN conferences were chaired by Lord Carnarvon, the 7th Earl, a Hampshire peer who lived at Highclere House. He sat on the cross benches of the House of Lords so was regarded as being politically impartial. Responsibility for arranging conference business was carried out by a Members Policy Group (MPG) of some thirty councillors which I attended on behalf of Hampshire. Many members were dissatisfied with the way the chairman of the MPG was elected for the first year. I was then supported in standing in the second year, and duly elected, and re-elected in the two subsequent years. This was the highest status position that I achieved during my service. I was complimented on the way I ran the MPG meetings in preparations for full Conference! I also believe that I moderated the debate on housing numbers – key planning criteria for regional plans – by challenging the then current ‘Predict and Provide’ formula, and a more appropriate ‘Plan, Manage and Provide’ process was subsequently considered. 4b. Solent Forum was an idea that I pursued during my second term of office – noting that a ‘forum’ was referred to in one of the Council’s own booklets. The Solent seaway and estuaries below low tide do not come under the jurisdiction of any council, although the Crown Commissioners have a role for seabed activities. The seaway is intensively used by a wide variety of interests: The Royal Navy, commercial shipping, recreational sailing, fishermen, diving groups, environmental groups, and recreational activities. I tabled a motion to full council: ‘to initiate discussions with interested bodies for the creation of a consultative forum for The Solent’. While a vote on a new topic risks being lost, I hoped that the Chairman would offer to refer it back to the officers for detailed consideration, and to report in due course. I happily agreed that it should be ‘referred back’. Two years later, a ‘Solent Forum’ was proposed and then implemented, chaired by a respected local person, to discuss (but not decide) upon matters of common interest. During my last four years on the Council, I became the council’s representative at the twice-yearly Forum meetings. The Forum has developed as a respected institution for consultation on the environment, with several working committees. It has since been emulated by the Dorset Coastal Forum, (‘the Jurassic Coast’ – a World Heritage Site). While not claiming responsibility for its progress, I am proud that I was able to launch the concept. The Panel was one of the working groups that I was invited to chair during my last four years of office. It considered modest schemes to enhance the environment of country villages – by revising road layout, undergrounding unsightly telephone wires, introducing rustic features. It came as a bonus when the officers asked whether Rowlands Castle should be included, focussing on a review and improvements to The Green – a designated ‘Conservation Area’. 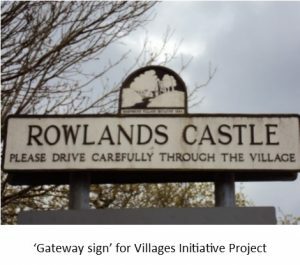 A detailed scheme was developed, presented to the Parish Council, and subsequently implemented, hence the ‘gateway’ signs. Some Conclusions: My service on the Council was most fulfilling and enjoyable. I felt that I had contributed to the community in many ways. This would not have been possible without the readiness of Joan, my wife, to bear most responsibility for bringing up two teenage boys during my frequent absences. I only became more aware of my over-indulgence later in life! My tenure of office was also facilitated by a group of local Liberal Democrat activists who kept me grounded on local matters and provided much needed support during times of elections. I was born in 1939, and lived in Kenton, Middlesex, near a well-established secondary school – Harrow County Grammar School. I entered the School having sat the eleven plus examination, and studied Geography, Economics and French to GCE ‘A’ Level. The School had a variety of clubs, societies and a cadet force, which helped in gaining entry to university. By the time I left school in 1957, I had been offered a place at Merton College, Oxford to read Geography in 1959. But in September 1957, I was called-up for my National Service, joining the Royal Corps of Signals, was commissioned and posted to Cyprus for eighteen months. I duly went up to Merton in 1959 and graduated in 1962. My first job was with United Steel Companies Ltd in Sheffield, initially as a ‘graduate trainee’, before becoming a sales clerk at a nearby steelworks in Stocksbridge. I resigned after eighteen months to study for the Diploma in Personnel Management at the London School of Economics. From 1965 onwards, my career was in Personnel Management with Esso Petroleum Company, Colgate-Palmolive and lastly IBM UK. I joined IBM in July 1969, an especially significant year as Joan and I were married in the May. Overall, I enjoyed my career of twenty-two years with IBM working in various Personnel functions, and lastly as Personnel Research Manager. I benefitted from a two-year secondment to the teaching staff of Henley Business School, where I also registered for a doctorate into ‘industrial democracy’ (finally graduating in 1984). The highlight in 1980, however, was a three-year assignment to IBM Europe where I learned about other countries’ industrial relations practices. My family came too, and we lived in the delightful Parisian suburb of Le Vesinet. IBM Personnel policies allowed me to stand for election to Hampshire County Council in 1985, based on ‘10% of time off for public service’, linked with ‘flexible working hours’. Then in 1991, six years after being elected to the Council, I took the opportunity for early retirement which enabled me to spend much more time on Council duties for the next six years. Editorial: Alan and his family have lived in Rowlands Castle since November 1983. This Article was first published in November 2018.